The “it” colors this Fall are moving straight from the fashion runway and into our homes. Available in 190+ colors, BlueStar™ kitchen pro appliances can be customized to look a little like your Fall wardrobe, from rich, deep browns to fresh, bold blues. Like the fashion industry, color is a critical component of the BlueStar product line, which offers an unrivaled 190 different colors that align with the latest and greatest seasonal trends. While we can’t tell you what colors will look best in your own kitchen, we can share fashion color trends from PANTONE®, a vital authority for designers in the apparel, home furnishings and interior design industries for selecting and specifying color. Every season PANTONE® releases a color fashion report highlighting the trendiest colors of that season. This Fall, color trends are big and bold, with brights like Ultramarine Green dominating the landscape. A professional quality BlueStar range dressed up in one of the season’s hottest colors is a powerful way to make a big design statement by introducing a “pop” of color into your kitchen décor. How can you bring a bit of autumn’s crisp, clear color into your home? Think kitchen color. Perhaps the flavor of robust, dark French Roast coffee would brighten your morning? Imagine a BlueStar in this rich brown or even in a milky Honey Gold if you prefer the smooth look of café au lait. Tangerine Tango is the reigning 2012 Color of the Year, while the sky’s the limit with a beautiful bright, bold Olympian Blue BlueStar. And don’t forget that small accents can make a big impact within your kitchen. Colorful range knobs can complement backsplashes, floor tile and seasonal decorations and mimic the Pantone colors of Fall without a big commitment. You can change the color of the BlueStar knobs with the season – or as often as you’d like. Unleash your inner designer with BlueStar ranges, wall ovens and hoods in a huge variety of colors to match any kitchen décor. Each range is fully customizable with an almost infinite combination of burner configurations, colors and sizes. 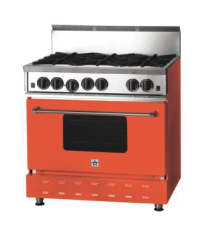 Use the online website tool ‘Build Your Own BlueStar’ to customize a new BlueStar range – from the intensity of the burners to the color of the knobs and the range itself – before buying. Handcrafted in Reading, Pennsylvania since 1880, BlueStar gas ranges are manufactured to provide the home chef with a cooking experience that only can be matched by a restaurant kitchen environment. BlueStar Ultra Nova burners provide up to 22,000 BTUs of cooking power for consistent, controlled heat and shorter cooking times.